The church, a possession of Cardigan Priory, was granted to Chertsey Abbey by Lord Rhys ap Gruffydd in 1165. The chapels and half a carrucate of land pertaining to it were included in the grant. On 21st June 1406 Philip Weny was presented with the position of Vicar by the Abbot of Chertsey Abbey. In 1488 the Vicar was “…an honest and aged priest…” called Rees. On 16th August 1513 Owen Griffith became the Vicar, succeeding Griffin ap David Duy, who had resigned. In 1535 the church was divided between three owners. One part belonged to the Prior of Cardigan Priory, another to the Abbot of Talley Abbey, and the remainder to the Vicar of Ferwig. When Cardigan Priory was dissolved in 1538, Owain ap Gruffydd was still the Vicar. A chalice at the church was dated 1615. A porch was added in 1627. In 1663 Rev. John Morgan became the Vicar. In 1667 Rev. Richard Harries became the Vicar. In 1667-70 Rev. Richard Harries was the Vicar. In 1715 Rev. T. Richards became the Vicar. On February 3rd 1855 Mary Rees, daughter of Rev. Thomas Rees, died aged 18. On May 22nd 1855 Thomas Rees, son of Rev. Thomas Rees, died aged 16. On March 21st 1864 Rev. Thomas Rees, the Vicar, died aged 64. On 12th April 1912 Rev. Daniel Harries Davies resigned. On 24th May 1912 Rev. John Jones (b.1865) became the Vicar. In 1914 Rev. John Davies became the Curate. On 18th September 1917 Rev. John Jones married Miss Evelyn Morgan-Richardson of Rhosygilwen, Cilgerran. On 22nd August 1929 the Bishop dedicated a new organ. In August 1930 major renovations were being undertaken here. Rev John Jones retired on 6th February 1942 and died on July 4th 1943. On 9th December 1943 Rev. T. J. Thomas, Curate-in-Charge, married Miss Mary Harper. In January 1945 Rev. T. J. Thomas was still the Curate-in-Charge. In late September 1945 Rev. D. Thomas Richard was appointed Curate. In November 1947 electric lights were installed here. In 1948-52 Rev. D. T. Price was the Curate-in-charge, having succeeded Rev. D. Thomas. In April 1957 Rev. J. E. Jones became the new Vicar. 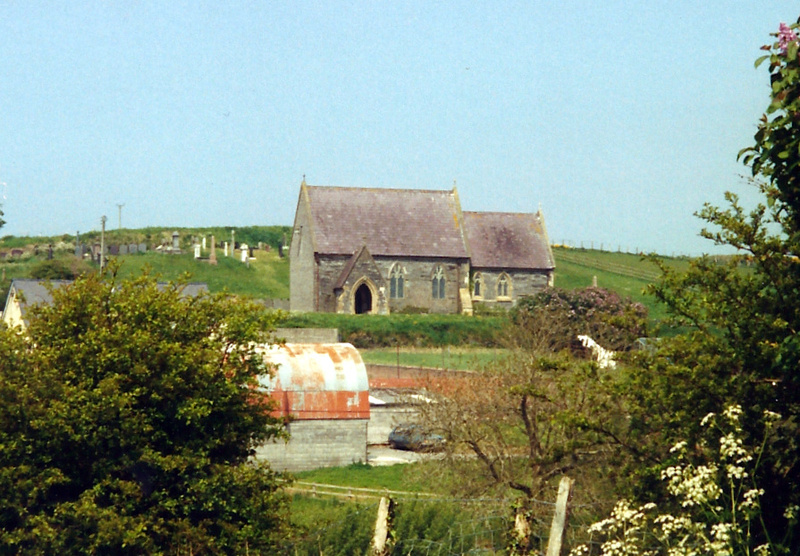 In September 1957 an extension to the churchyard was dedicated by the Bishop of St David’s. In June 1958 the Archdeacon dedicated a new window here. The ancient tower was largely demolished in February 1968. In February 1974 Rev. Alfred Joseph Davies became the Vicar. In 1976 the Royal Commission referred to the removal of the foundations of the tower and to burials beneath that pre-dated the structure. The tower had been demolished “…in a rather informal manner…” In May 1976 the Church was re-opened and re-dedicated following repairs. Rev. E. E. Jones was then the Vicar. In 2005-09 Rev. John Powell was the Vicar. Anglican Church of 1853 in coursed blue lias with steeply pitched slate roofs, coped gables with cross finials and sandstone traceried openings. Sandstone quoins to angles. Single storey with W chancel having attached vestry, taller nave to E with S porch, tower demolished. Stone block W wall. Nave has 2 bays of sandstone traceried arched-headed Gothic lights with hoodmoulds and leaded glass. South wall has gable-fronted porch to W and two bipartite traceried windows. Porch has coped gable, pointed Gothic arched door and steep slate roof. Chancel has small lean-to vestry in similar stone, slate roofed, to NE near angle. 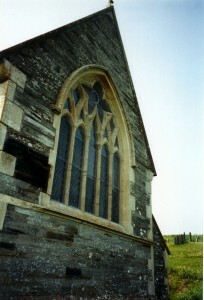 East wall has raised sandstone sill band beneath large Gothic arched, hooded and traceried window. Five pointed star above 5-light, outer pairs with Gothic heads and ogee head tocentre light. South wall has single light to left and bipartite window to right. Some stone buttressing evident. Hanes Ysgol y Ferwig 2007.